Feeling crafty? I am! Our OKMH gang is getting together for a weekend in just 10 days, and I’m beyond excited. All seven of us under the same roof for the first time ever? It’s going to be epic! 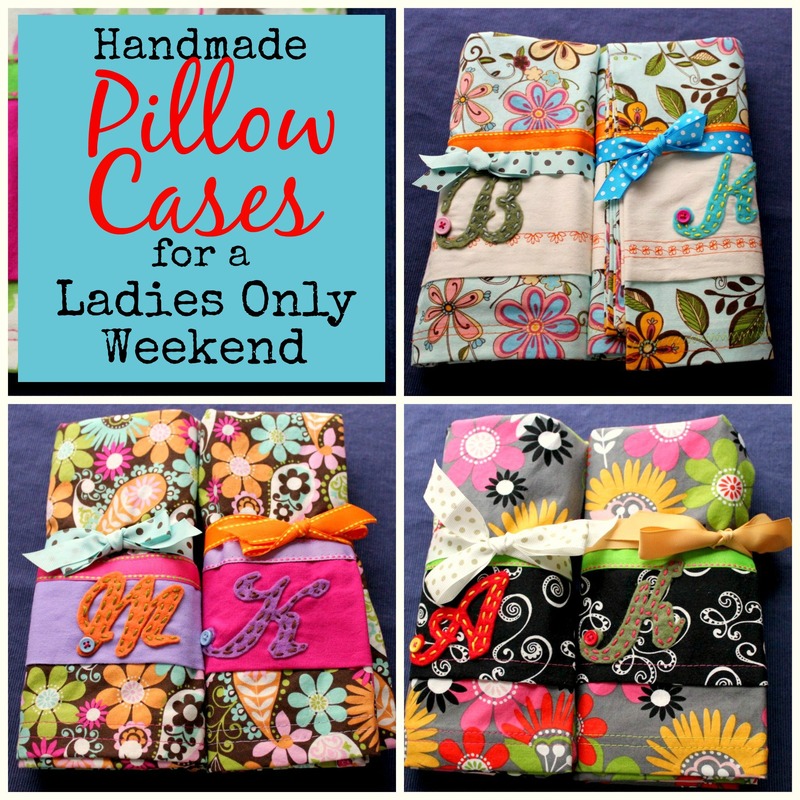 As a special treat, I made pillowcases for the girls – bright, colorful, girly pillowcases. What’s a girlfriends weekend for, after all, if not pampering, shopping, cocktails and flashy floral prints? This is my simple DIY tutorial for decorative pillowcases. Start by washing and ironing your yard of quilting fabric and the coordinating solid, then trim off any scraggly threads along the unfinished edges. 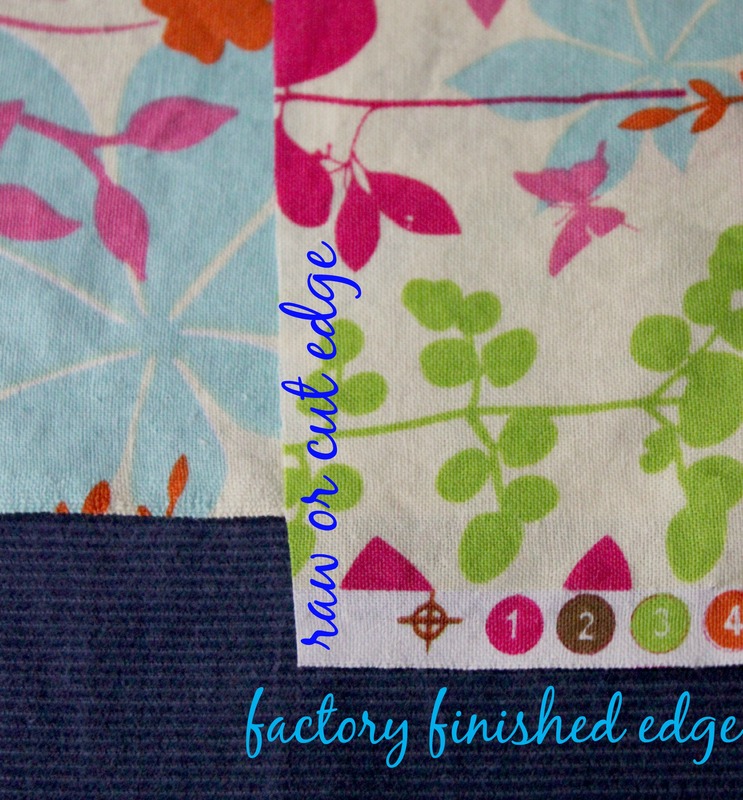 Fold the yard of quilting fabric in half lengthwise with the good sides facing each other. Because quilting fabrics come from the factory with finished edges, this means your longer sides will already be ‘finished’ and only the top & bottom of the pillowcase will need to be edged to keep it from unraveling. 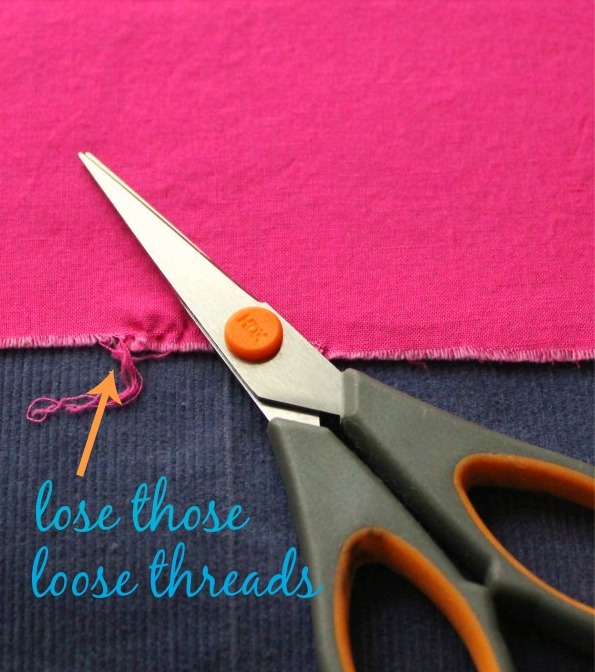 Pin the long side of your pillowcase and stitch it twice, so it’s extra sturdy. CAUTION: some fabrics have white edges and print along the finished edges. 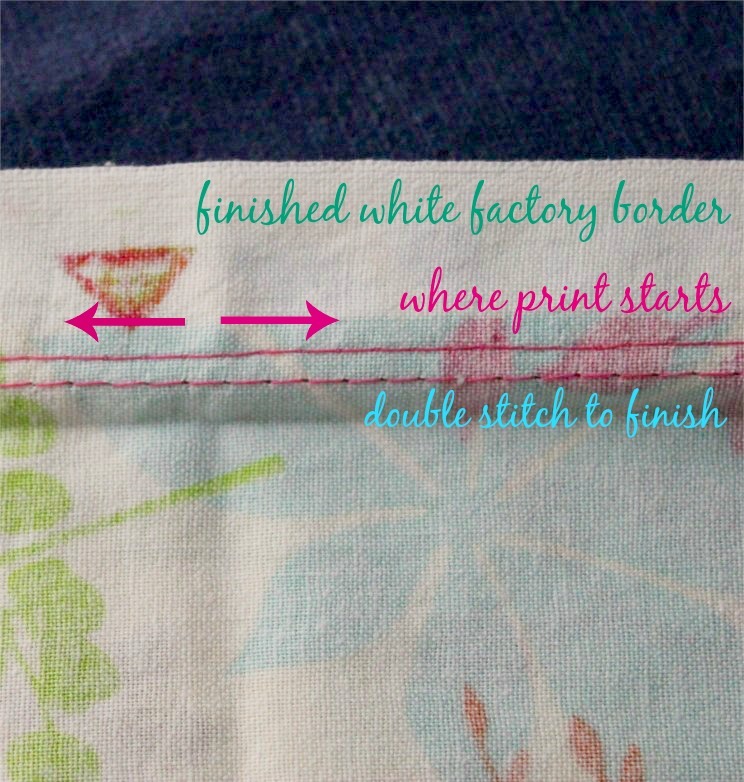 Be sure to stitch inside that line so this doesn’t show on your finished pillowcase. I’ll show you what I mean. 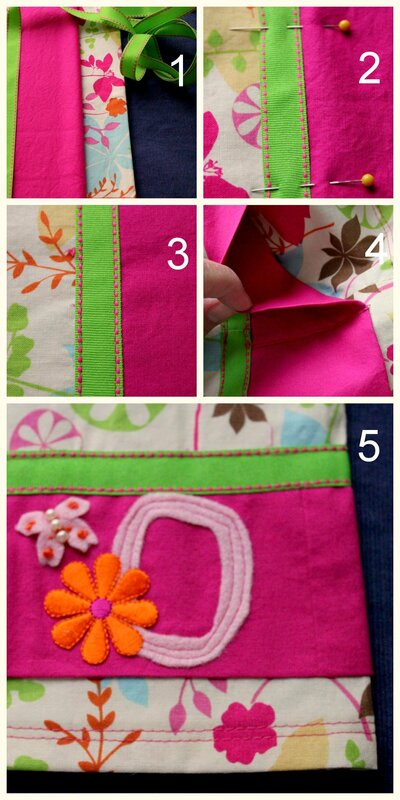 Here’s a simple trick for stitching the bottom of the pillowcase. Because the edges are ‘raw’ they can unravel when washed. I like to use bias tape to cover the raw edge. It helps create really sharp edges when the case is turned right-side out. Place your bias tape halfway beneath your unfinished edge, leaving at least 1/2″ of excess tape on each end. Fold the edges in so they’re flush with the edge of the fabric, then bend the bias tape in half to cover the entire edge and pin it into place. Double stitch all the way across to secure the tape. When done, trim off your thread tails and turn the case right sides out. Use a ruler to push your corners into a perfect right angle, and press your pillowcase. Now we’re ready to tackle the opening and decorative trim. 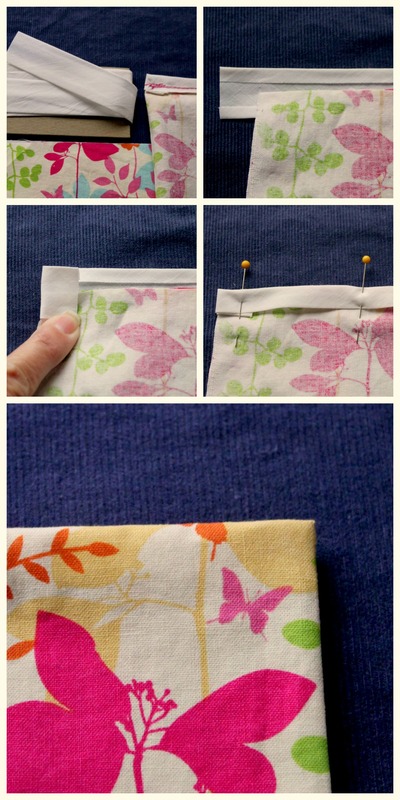 For the opening of the pillowcase, I turn the raw edge under 1/2″ and press, then turn under 1/2″ again and pin it in place. Again, double stitch for a more professional finish. If you’re making a simple pillowcase, you can stop here. But if want to embellish, a simple ruffle with ribbon trim is a great way to go about it. 1. 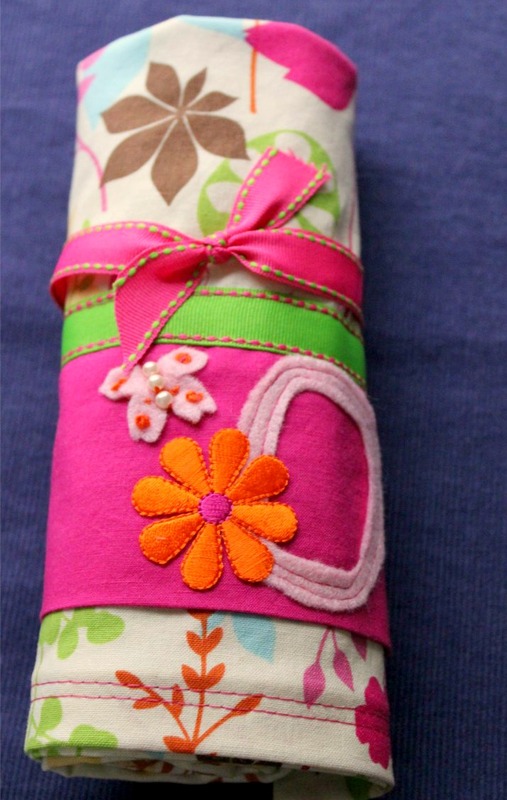 Fold your solid trim fabric in half lengthwise and lay it on your finished case. I like to place the folded edge about 1″ from the finished opening of the case. 2. Lay out the ribbon, aligning it so that it just overlaps the cut edge. Pin the ribbon and ruffle into place so that the two edges meet at the side seam. 3. Stitch it all into place. I like use a ribbon with decorative stitching, and sew just along both sides of that stitching. 4. To join the two ends, fold one edge of the ruffle fabric in about 1/2″ and press it flat. Tuck the unfinished edge inside to hide it. Fold one end of the ribbon under 1/4″ or so and pin it to cover the other end of the ribbon. To finish, stitch across the folded edge of the trim to close it. 5. One last flourish – monogramming. I took this one a step further with an iron-on flower and a small felt butterfly because this one is for the young daughter of a friend. I hope she’ll love her butterfly with pearls. For the ladies, I embroidered the monograms and finished them with a cute little button in a contrasting color. When done, I folded the pillowcases and tied them shut with a coordinating ribbon. Here’s a look at some of the finished pillowcases for our first One Kitchen Many Hearts weekend. I just love how they turned out. There’s so much joy in a handmade gift, and I admit I had a ball making these! Even better, the ladies will all have a keepsake from our first weekend together. Now I just need them to hurry up and get here. Not that we’re watching the clock or anything (we’re all totally watching the clock), but SHAKE A LEG, LADIES! We need to get this party started!